Use our Category Dojo tool in the Sandpit to create your spend categories, enter their data and compare results. Our Sandpit features offers the ability to review basic FREE reports such as Sourcing Strategy, Spend Vs Complexity, Prioritisation and Report Summaries. 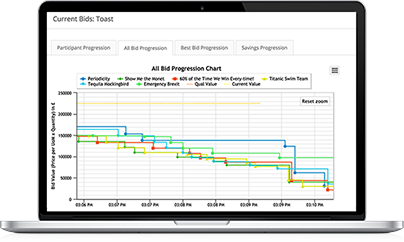 Run your newly discovered opportunities through our intuitive Sourcing tool. Create your own fully unique and branded domain to run events through. Seemlessly share data between other solutions via what is commonly known as an API Integration. Should you wish to purchase licences for both Market Dojo e-Sourcing and Category Dojo, please talk to us as we may be able to offer a discount. We accept payment via Visa, MasterCard, American Express and PayPal. We also accept payment via bank transfer for monthly or annual subscriptions. For further details, please contact sales@marketdojo.com . Will I always have access to my data? Yes, your data will always be available to you, whether you are a paying customer or not. What about specific customer requirements? We are flexible to specific customer requirements. Please contact us to discuss other pricing options. We are very proud to be in partnership with a first-class application hosting provider, Liberata, who are accredited to hold central government data, ensuring the very highest security and assurance requirements are met. Yes, you can create reports from your data which can be exported. When you sign up with us, our team will make sure to support you at every step.